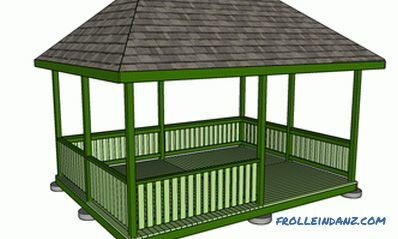 This article is about how to build a gazebo with your own hands. It is quite easy to do this, especially if you have all the necessary materials and tools at hand, and a ready plan in your head. 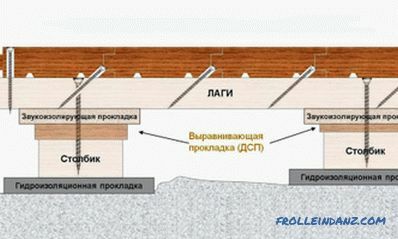 We recommend that you, while getting to work, study the construction standards valid in your region (foundation depth, distance between rafters, recommended materials, etc.) and legal requirements. Always use high-quality materials and professional tools if you want to make an arbor, for the appearance of which you will not be ashamed. 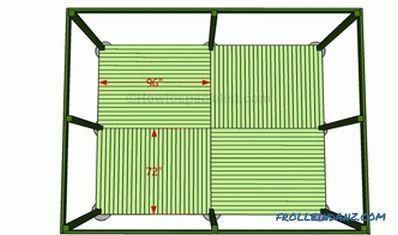 F - Flooring: bars 5 * 10 cm long 240 cm (40 pieces) and 180 cm (52 ​​pieces ); Protective gloves, goggles. O - Exterior roofing: bituminous roofing tiles (tiles), 600 pieces. At the end of basic construction work, fill the holes for the caps of the self-tapping screws with a putty wood and level the wooden surface. Apply several layers of wood stain to all wooden elements of the structure. 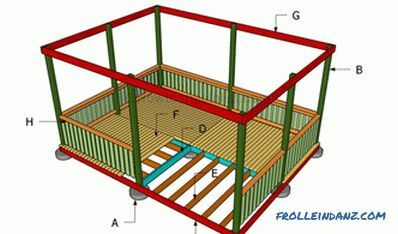 Scheme of a rectangular arbor. 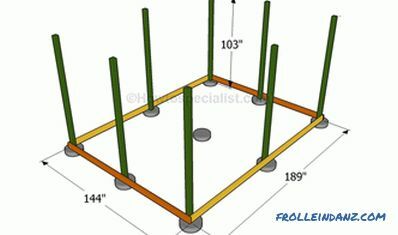 Before starting construction work, you must mark the perimeter of the future gazebo on the ground, using pegs and a rope stretched on them. With the help of a carpenter's square, make sure that all angles are straight. Measure the diagonal of the rectangle. If necessary, make the necessary adjustments. Installing arbor racks is perhaps the most important step in the construction process, so you must approach it with due attention and responsibility. Dig holes 60-90 cm deep (at least 15 cm below the frost level) and tamp the bottom layer of soil. 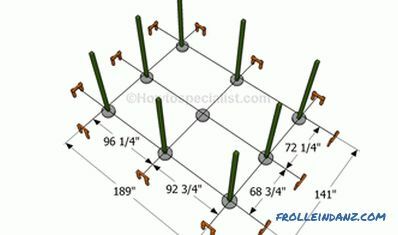 Place tubular formwork in the hole and fill in a small amount of concrete, after which racks can be installed. Tip: Use a spirit level to ideally set up wooden posts vertically. 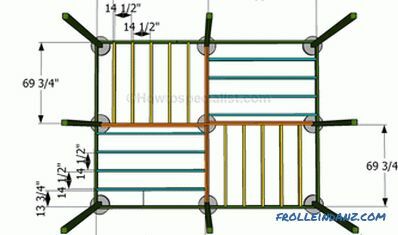 Temporarily, until the concrete is frozen, fix the racks in two directions. Make sure they are all on the same level. Allow the concrete to harden for several days before installing the bottom trim. Cut the bars of the desired size and secure them to the outside of the racks with 9-inch self-tapping screws. In order to prevent splitting of wood, before drilling the screws, drill guide holes in the right places. 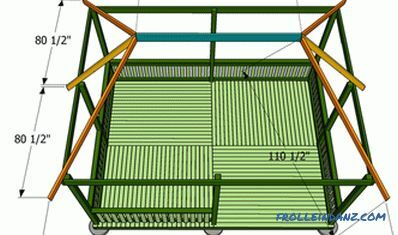 Make sure that the strapping bars are arranged horizontally - it will depend on it how flat the floor of your gazebo will be. The next step in the project is to install intermediate lags for the floor.As you can see in the picture, they must be fixed to the middle racks. Make sure the logs are horizontal. 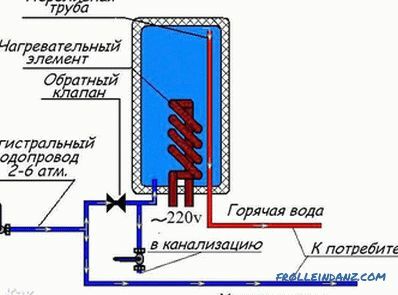 Location and installation of the support lag for the floor. Lags should be placed every 40 cm to evenly distribute the load. 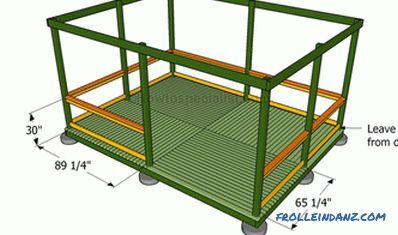 Place the spirit level on top of the mounted bars to ensure that the floor crate is level. To fix floor logs in their place, we recommend using special steel clamps to support the ends of wooden beams. Make sure that the clamps are at the same distance from each other and on the same level. Fastening elements of the flooring. Flooring is a simple process, but you should think in advance about the most appropriate design. Fix the floor boards to the logs with 6-centimeter galvanized screws, pre-drilled and riddled holes. It will be necessary to leave a gap between the boards. This will allow water not to accumulate on the floor, which means that it will not be exposed to the damaging effects of excessive moisture. In order for the gaps to be the same everywhere, we recommend inserting carnations between the boards when laying the floor. Install the top trim components on the top of the racks and secure them with 9-inch self-tapping screws. Use the spirit level to make sure that the beams are horizontal. Making a pergola fence is easy enough; the main problem here is to choose a design that matches the style of your home and garden. First of all, it is necessary to establish horizontal crossbars between racks, securing them with 9-inch galvanized self-tapping screws. 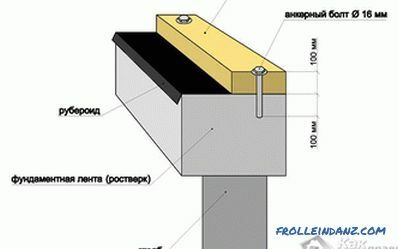 Use the spirit level to control the horizontal position of the mounted structural elements. After the balusters are securely fixed to the place intended for them, secure the railing on the upper horizontal bar with decorative studs (you can additionally use glue to increase the strength of the joint). You can choose the shape of the roof at your discretion. 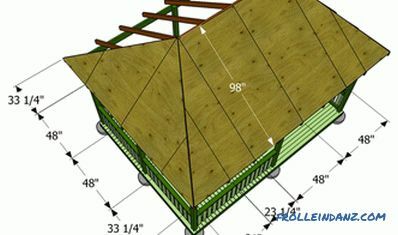 There are many options here - from the simplest gable construction, the construction of which any person with basic skills can handle to a unique roof, the construction of which will require a lot of effort and materials. 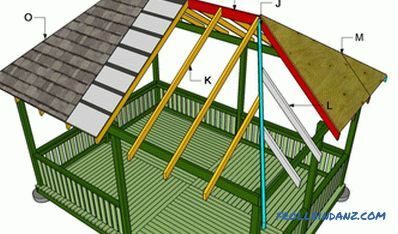 To begin the construction of the roof, you need to install the ridge and angular rafter legs. 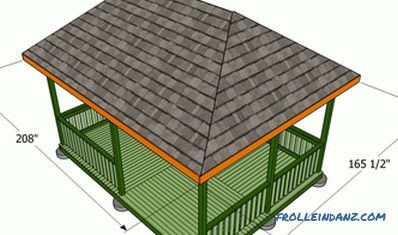 Make sure that the ridge of the roof is mounted horizontally, otherwise the roof of your arbor will be asymmetric. 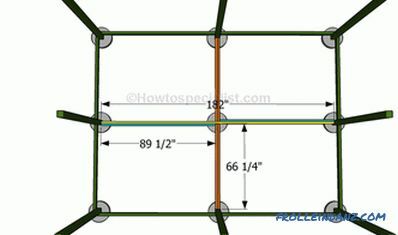 Tip: Ask a friend to help you with the construction of the roof frame. One person must hold the elements in their place, while the other will fasten them with screws. Installation of main truss legs. Now you need to install rafters on the sides of the roof. They should be located at a distance of 60 cm from each other, starting from the center. Drill the guide holes and fasten the rafters with 9-inch galvanized screws on the corner truss legs and top trim. Installation of auxiliary truss legs. 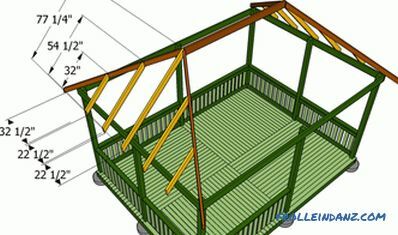 After that, install the rafters on the front and rear slopes of the gazebo roof. Their mounting is carried out by screws to the ridge of the roof and upper trim. 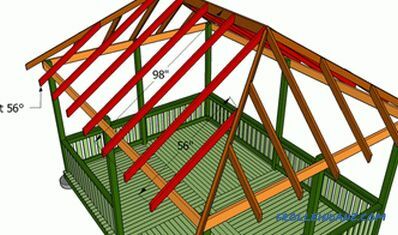 In order for the roof frame to bear its weight, it is necessary to place the rafters every 60 cm, starting from the center. Align the rafters at both ends and secure them with self-tapping screws. To prevent splitting of wood and at the same time get a rigid joint of elements, drill the guide holes at an angle. 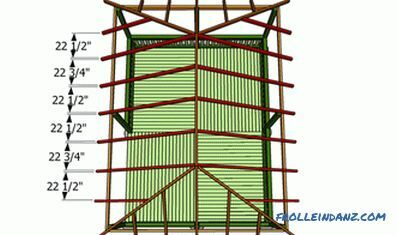 The layout of the rafters. 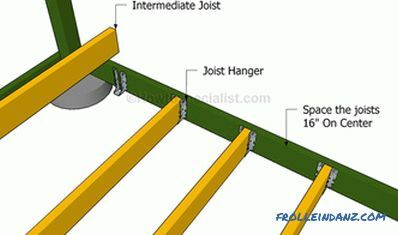 Attach 20 mm thick plywood sheets to the rafters as shown in the figure. We recommend that you saw off the sheets with a circular saw before attaching them to the rafters. Plywood sheets are fixed using 3 cm self-tapping screws, which are screwed along the rafters every 15 cm. 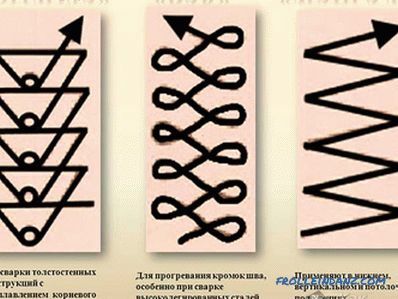 Do not leave between the sheets of gaps and gaps. 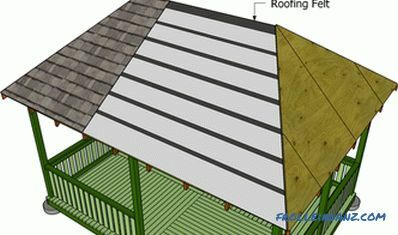 Roof lining with sheets of plywood. To protect the gazebo from water damage, we recommend that you cover sheets of plywood with roofing sheets or roofing felt. Make sure that the bands of material overlap by at least 5 cm and secure them with brackets. For a roof ridge, cut a piece of roofing material 30 cm wide. Mount the drip along the perimeter of the roof, placing its edge under a layer of roofing material. Before laying shingles, carefully read the manufacturer's instructions. Tip: When laying tiles, each subsequent row should be displaced horizontally relative to the previous one by half tiles.Vertical layers of tile stacked overlap. Attach a decorative strip to the ends of the rafters, fix it with the help of finishing nails. Do not leave gaps between the plank and roofing sheets. Decorative trim on the edge of the roof. The gazebo is ready, you just have to take care of the minor touches. Fill the holes with wood putty and allow it to dry for several hours. Sand wooden surfaces with fine sandpaper. 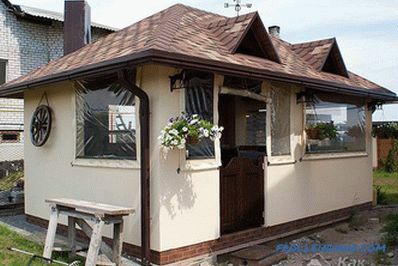 Cover all wooden elements of the structure with several layers of wood stain or paint. 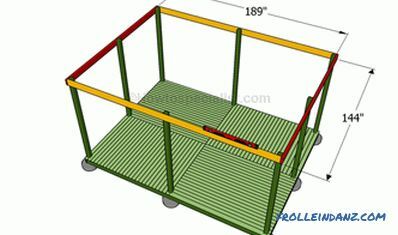 This will help not only protect the tree from rotting, but also improve the appearance of the arbor. 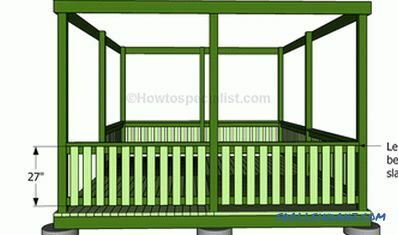 Now you know how to make a gazebo with your own hands. 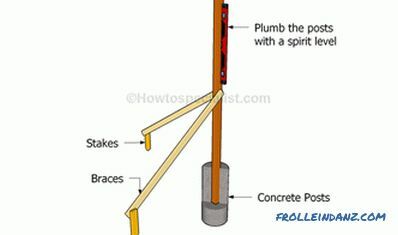 Anyone with elementary woodworking skills will easily cope with this work if they follow our step-by-step instructions. However, be careful and do not forget common sense if you want to avoid costly mistakes and potential problems.